Who hasn't jumped on board with this entire succulent craze? I like it as I usually "forget" to water to water my plants and so the succulents are a perfect fit for me! 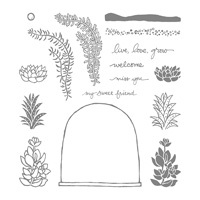 I cannot believe how many different varieties there are of succulents and was intrigued when Stampin' Up! debuted the stamp set, Live, Love, Grow with this last catalog. One of the newer things at my Downline Meetings is that I give a bundle of product to three of my downline that volunteer to be "creative geniuses" at my group meetings and create a display board using that bundle of products. 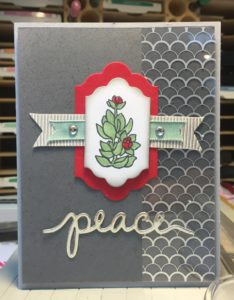 Now I challenged Cheryl Lentz, with the Live, Love, Grow set and she hesitantly said "ok…but it's really not my FAVORITE set. 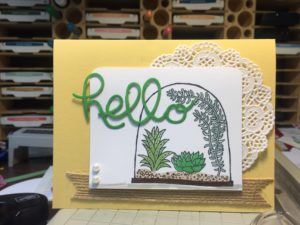 Her text to me THIS week was "I'm having so much fun with this set" "I LOVE it" Here are two of her creations and I think you would have to agree with me..this set is stinkin' cute, as are the many succulent projects I see out there on Pinterest. It's an addiction! I think you need this set. Order it today!